Tyburn Convent was established in 1903, near the site of the Tyburn Tree Gallows – famous for hosting the executions of a number of historical and well-known public figures (including Oliver Cromwell and Roger Mortimer). 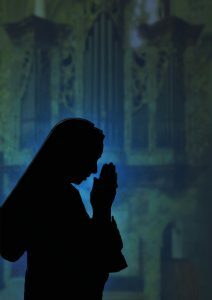 The convent is now home to a closed order of Benedictine sisters, who still form a community within its walls. Tyburn Convent contacted JEM Energy earlier this month, with an inquiry as how best to modernise their water heating methods, with a reliable and eco-friendly water heating solution, that would ensure that the sisters living there would be provided with enough hot water all year round, and not just during the summer months. 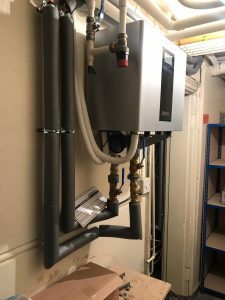 Other than environmentally harmful fossil fuel systems, thermodynamic water heating technology is currently the only way to guarantee year long renewable hot water. Solar thermal systems, and other similar hot water heaters, simply cannot be relied upon for the entire year, as they still require a back-up method of water heating to generate hot water during cooler months of less sun exposure. Due to the vast size of the convent, the layout of pipework and access points, alongside the number of people residing there (all requiring hot water on a daily basis), it was decided that it would best suit everyone’s interests, to install four thermodynamic hot water systems on the premises. 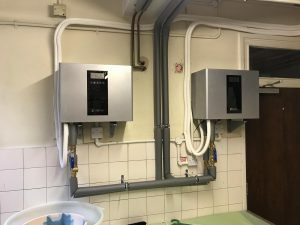 These installations consisted of one double Bunsen Air system that was connected to a larger hot water cylinder, alongside another Bunsen | Thermodynamic Water Heating System, which was connected to a smaller cylinder. And then one further Bunsen Air system, that was installed on the far side of the convent… (so four Bunsen Air systems were installed in total). As the Bunsen’s Air’s thermodynamic hot water panels needed to be relatively close to the internal Bunsen Air Units, some of the solar collector panels were double stacked twice, so they were infact… quad-stacked on a side wall. 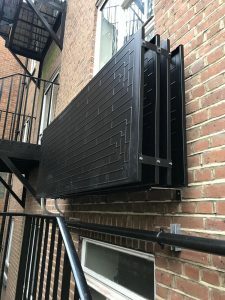 System operational levels were not impacted by this, this method of hot water panel mounting just saves on space, and in this case, ensured that the specialist refrigeration pipe work connecting the external and internal components of the thermodynamic water heaters would not be over-stretched! Although one of JEM Energy’s most sizeable and challenging Bunsen Air commissions to date, this large scale installation went tremendously well, with all four Bunsen Air systems connected securely, making Tyburn Convent a fantastic example of the greatest possibilities when it comes to modern renewable systems being integrated into very old, and in this case – historic settings… and how these possibilities can easily become reality. 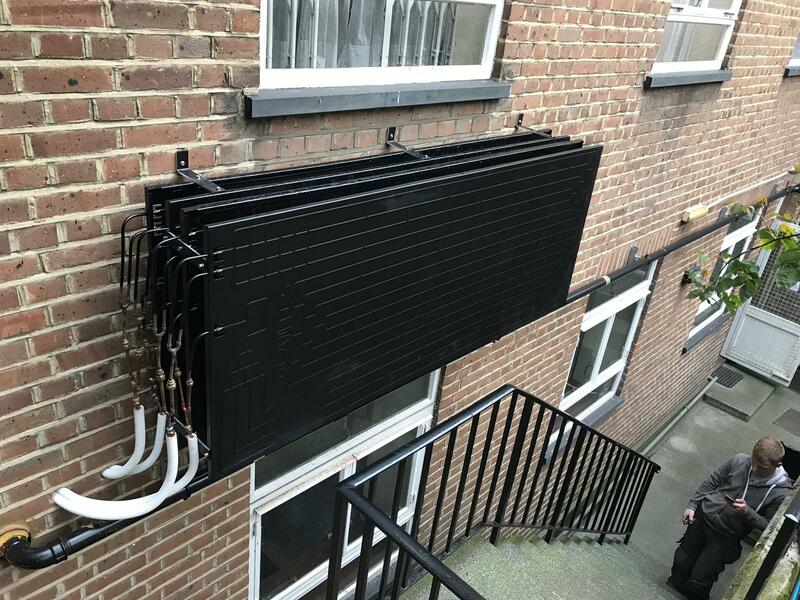 JEM Energy have since been contacted by Tyburn Convent, who have reported that they are so happy with their Bunsen Air | Thermodynamic Water Heating systems, they would like to install a further 2 on the building and its grounds!